A muggy Sunday in July, with a most un-Mediterranean heat and light bathing Clerkenwell. We are gathered outside St. Peter’s Italian Church, waiting for the start of London’s longest running Italian spectacle. 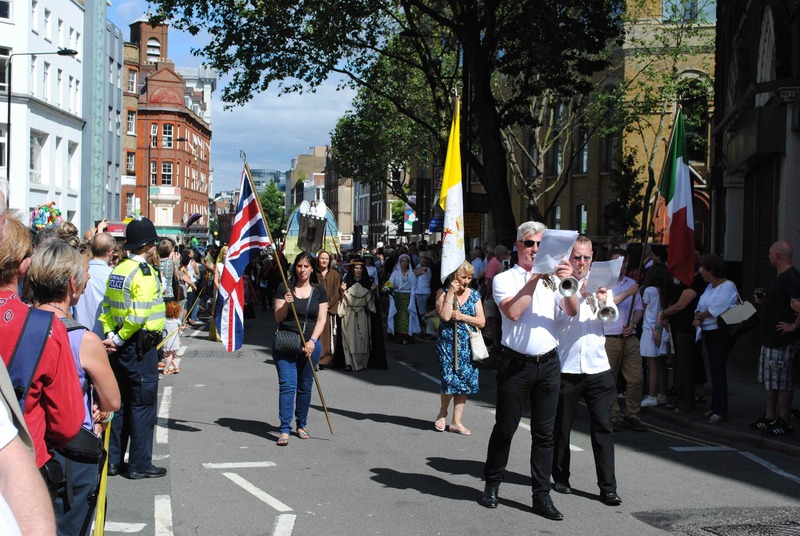 This is the day of the one hundred and thirty first Procession of Our Lady of Mount Carmel, otherwise known as the Italian Procession, which has paraded through this same small circuit of streets since the 1880s. 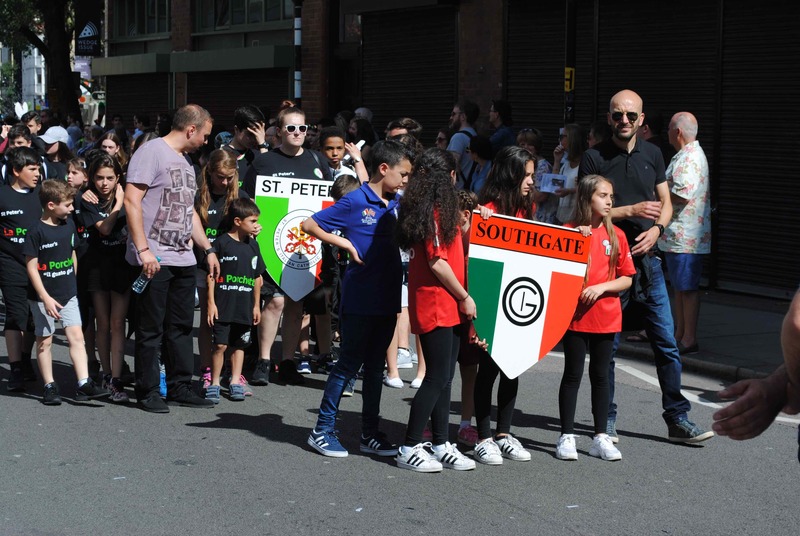 The floats depicting scenes from the New Testament start their engines, the effigies of saints are raised, the singing matriarchs and solemn patriarchs ready themselves, all seemingly conjured as much from an Italia of the imagination as from the London-Italian diaspora of today. I once watched, fascinated, as their old man gutted and cut up a chicken. We bought our meat from the butcher already prepared. I had never seen anything that looked vaguely like an animal turned into meat for the pot before and there was something strange and primal about the ritual. The old man was quick and expert. At one point he waved the glistening yellow-brown caeca in my face and, laughing, said ‘Sheeet’. London, of course, was founded by Italians. Though once the Legions exited and left the Romano-Britons to fend for themselves, it wasn’t until merchants from Lombardy, Tuscany and other northern regions established themselves in the city in the 15th century that an Italian presence was visible again. This small group (just 70 of them, according to Stephen Inwood’s History of London) controlled a quarter of England’s overseas trade and most of its banking. The resentment of the ever-febrile London mob towards such a concentration of wealth and power in the hands of ‘strangers’ was manifested in several anti-Italian riots and continual street harassment. This dominance of trade and banking was long past by the time of Elizabeth I, when another and larger group of Italians came to London. They belonged to what would now be called the ‘highly-skilled’ category of immigrants: physicians, glassworkers, fencing masters, riding instructors, painters, all of them attracted and encouraged by a wealthy and acquisitive nobility. One Prospero d’Osima established a school for young horsemen on Clerkenwell Green, a two-minute trot from where the Italian Church stands today. Given the fiercely anti-Catholic sentiment of the age, it might seem odd that Italians were able to attain such prominence, but money and desire will usually trump all in London. 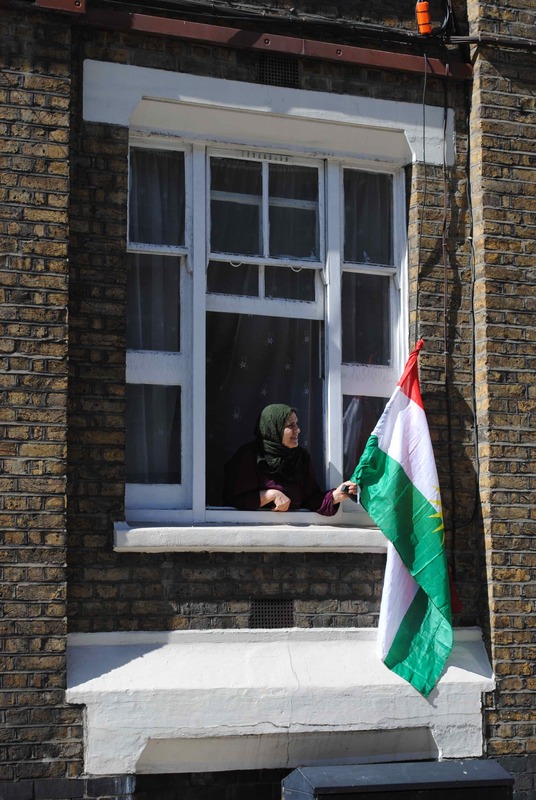 It was a later wave of Italians immigrants – more numerous and impecunious – whose settlement around Saffron Hill in Clerkenwell led to the area becoming known in the later 19th century as Little Italy. The earliest group of artisans – clockmakers, jewellers, goldsmiths – were joined by musicians, knife grinders, piano makers, artists’ models and, eventually, ice cream makers. By 1845 the numbers were such that plans were made to establish an Italian church, and St Peter of All Nations opened on the Clerkenwell Road in 1863. But though the Catholic Emancipation Act of 1829 went some way to normalizing their position, these were still uncomfortable times for Catholics in England. 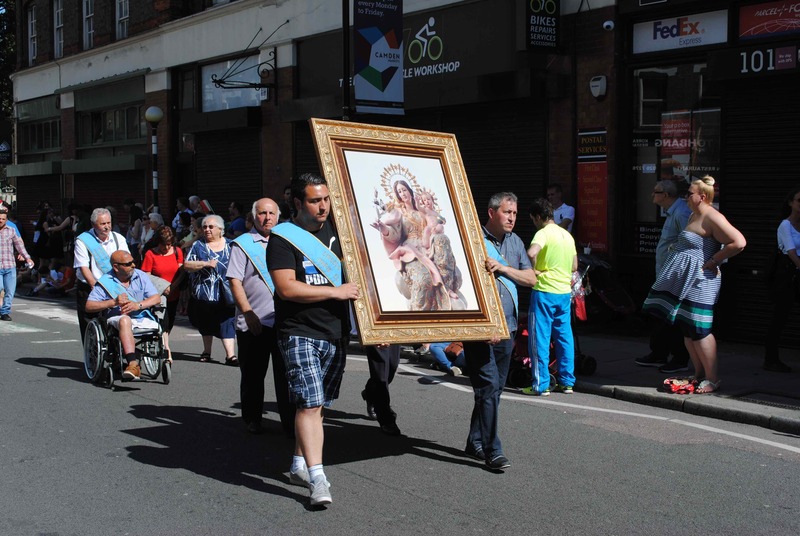 It is perhaps surprising that at some point in the 1880s permission was granted for the first Procession of Our Lady of Mount Carmel, an overtly Roman Catholic event, and probably the first of its kind since the Reformation. Excepting wartime, the Italian Procession has been an annual event ever since. And now the London-Italians are one of the least visible of the capital’s diasporas. Not exactly forgotten or ignored, but usually unacknowledged. The London Encyclopaedia entry on Clerkenwell does not even mention the historic Italian presence in the area. 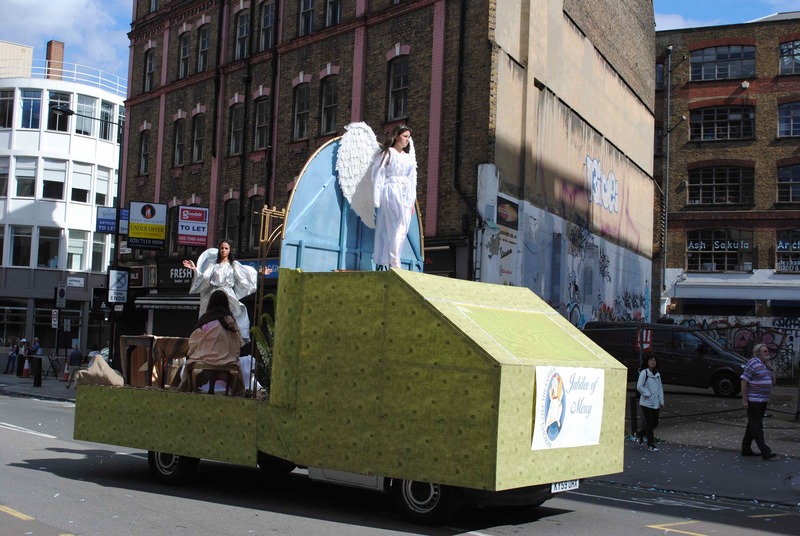 So the Procession is both a celebration and a reminder of that presence, even though the old families are long dispersed to the outer suburbs of London and beyond. It’s a reminder too, for those without Italian ancestry, of the old religion of this island. Roman Catholic spectacle is still a rarity in Reformed England. As I watched the tableau of the Annunciation, the Wedding at Cana, the Garden of Gethsemane and the rest, I couldn’t help reflecting on those secular, non-Italian Londoners who lined the route. Who doesn’t love the Italians, with their food and their style and their crazy politics? Those who would ordinarily be suspicious of ethno-religious demonstrations were clearly enjoying the charm and theatricality of the occasion. One wonders whether a parade of, say, London-Ulster Orange men and woman would have been greeted so warmly. And what, after all, have the Ulster Protestants ever done for world cuisine? EP Thompson once wrote about the enormous condescension of posterity, but there’s also something like the enormous condescension of secularism. But none of that really matters. Here are the London-Italians, still here, still proud, still parading.